The duo made a surprise night club appearance on Thursday night. Kanye West and Kid Cudi performed together as Kids See Ghosts for the first time in L.A. on Thursday night. The pair played a surprise show at Los Candiles Night Club in front of a private audience. 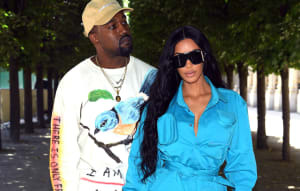 Social media footage from the show, including some from Kendall Jenner, shows the pair performing “Ghost Town” from their collaborative album, plus Kanye West songs "Can't Tell Me Nothing" and "Father Stretch My Hand Pt. 1"
Earlier this week it was announced that Kids See Ghosts will headline Tyler, The Creator's Camp Flog Gnaw festival in November. Check out footage from the Los Candiles show below. Kanye West e Kid Cudi se apresentaram na festa do designer Willo Perron no 'Los Candiles Night Club', em LA ontem a noite.